Once used to hunt whales, this historic whaling boat, also known as a Chalupa, is on display at the Interpretation Centre at the Red Bay National Historic Site in Labrador, Canada. A large wall mural of whalers, a whale and the boat once used, creates the background for this historic exhibit. Part of the culture and tradition of the Native Indians who resided in Labrador, was whaling, where they would hunt and kill these massive mammals. Red Bay was the centre of a Basque whaling operation during the 16th century and many artifacts from those years are on display at the Interpretation Centre at the Red Bay National Historic Site. 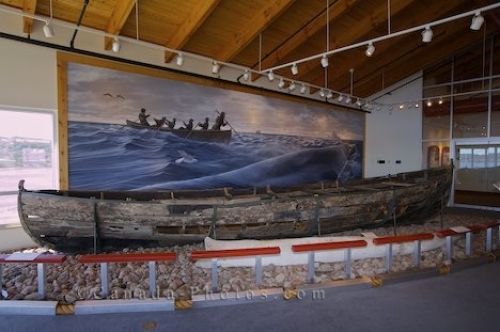 Picture of a small historic whaling boat backdropped by a wall mural at the Red Bay National Historic Site in Labrador. ... the Red Bay National Historic Site of Canada Interpretation Centre, Red Bay, Strait of Belle Isle, Viking Trail, Trails to the Vikings, Labrador Coastal Drive, Highway 510, Southern Labrador, Labrador, Atlantic Canada, Canada.